Because there were few options for protestant schools back when I was little, my mother sent me to Catholic school for my elementary education. 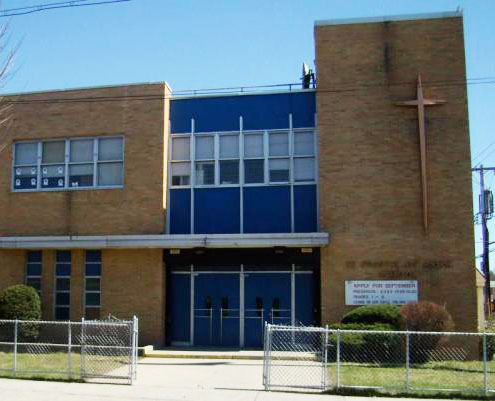 So, from first through fourth grade, I attended St. Francis of Assisi School on Baychester Avenue in the Bronx, NY. I remember it as though it were yesterday. I particularly remember the principal, a towering nun, who scared the bejeezus out of me-- Sister Mary Terrence (may she rest in peace). Talk about a strict disciplinarian! 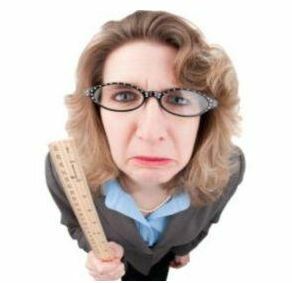 I saw her pull more than a few badly behaved boys into her office-- by their ear. I have so many cherished memories from those years at St. Francis. In first grade, when Ms. Greco was going over the lesson plan one day, she asked us to raise our hands if we had any questions. A classmate named Inguy raised his hand. Inguy was the resident class clown, rarely asking anything with serious intent, so I knew that something was off from the very start. But being the ever faithful encourager, Ms. Greco called on him anyway. "Yes, Inguy? ", she said sweetly, granting him the floor. Inguy smiled, then shouted, "Who watched Batman last night! ", and shot his own hand up in the air, signaling others to the appropriate response. The whole class followed suit, with some shooting both hands in the air enthusiastically. Everyone was laughing, amused by the fact that at least 35 other classmates had been watching Batman the night before, too. Ms. Greco was not happy. My memory is foggy as to whether or not Sister Mary Terrence was called in to handle that particular infraction. But what I do remember is that Inguy's run with the rest of us at St. Francis ended soon thereafter. One day he was there, and then one day he quietly "disappeared" from our school, and we haven't seen him since. Another memory that I have is of Mr. Norton, my fourth grade teacher, sending me down to speak with one of the priests, Father Burns, about a few doctrinal questions that I had. 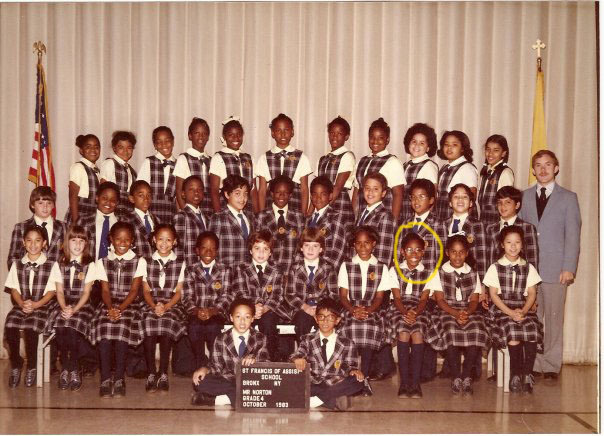 My 4th grade class picture. I still remember the names of a lot of these people. Friends with some on Facebook! In any case, I went down to the chapel, but found it empty. I knew that Father Burns couldn't have been far, so I decided to wait for him. While waiting, I couldn't help but noticing the shiny gold tabernacle at the top of the altar. 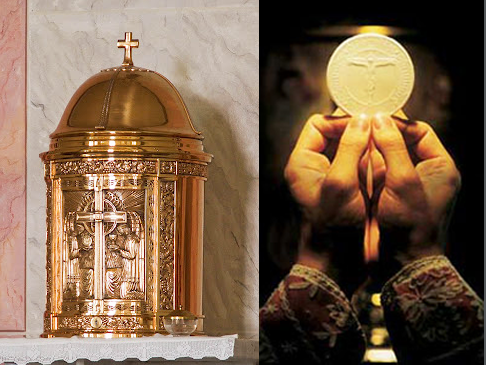 That was where the priest kept the Eucharist (communion bread) before serving it to the congregation. Oh, how I longed to taste the Eucharist! Since I wasn't Roman Catholic, I wasn't allowed to have any. But from my distant seat in the chapel, I had always marveled at how perfectly circular that piece of bread was. And so thin! I imagined it tasting like a slice of mildly flavored soap. So now here I was...ALL ALONE in the chapel, and that tabernacle was just calling my name. I looked quickly to my left and my right, and after being sure that no one was there, I dashed up the steps of the altar, and tried to get the tabernacle door open. But, that door wouldn't BUDGE! The next thing I knew, I heard footsteps coming from the sacristy, which was situated behind the altar. It was Father Burns! I only had a few moments to cover my tracks, so I raced back down the altar steps, turning to face Father Burns just as he reentered the chapel. From his vantage point, it looked as though I had just been coming UP the altar stairs to find him. Phew... Close call! Immediately, the memory resurfaced of my Catholic school classmates and I singing the the song, "Make me a Channel of Your Peace". You don't have to be Catholic to feel the sincerity of the words of this prayer, spoken humbly by St. Francis of Assisi, in his selfless love for others and for the Lord. Being used as an instrument of God is a privilege that we should aspire to. But even in being "on assignment", we must remember to remain humble, and to do as Christ did-- sacrifice for others and love them, so that they can be assured of who sent us. That's the lesson that this protestant girl learned in Catholic School. Enjoy the video and lyrics below, which are a contemporary rendition of "Make Me An Instrument of Your Peace", by Sara McLachlan. I was raised Catholic, but stopped going to church as soon as I could. When I was in my 40s, I returned to God (as if he ever left me), through a non-denominational church. I remember that song...loved it! Hey, Karen. LOL. The _sacristy_ is the room behind the altar where all the vestments and other liturgical items are kept. The Rectory was the house across the street where all the priests lived. Tabernacles are always locked. You were sent down to Fr. Burns??? Mr. Norton must've been pretty desperate! Ahhh.... the "sacristy". That word doesn't even sound familiar, so I most certainly did not remember it. Just changed "rectory" to "sacristy". Thanks, Karin! Funny... I knew that the Rectory was where the priests lived. But at that young age, I thought that they lived across the street, AND behind the altar! :-) But I also thought that Mrs. Orth lived at the school, so that should give you some sense of my mindset at the time. I remember you, too, by the way. When I walked home with Melanie and Wendy, you were with us (usually in front or behind).